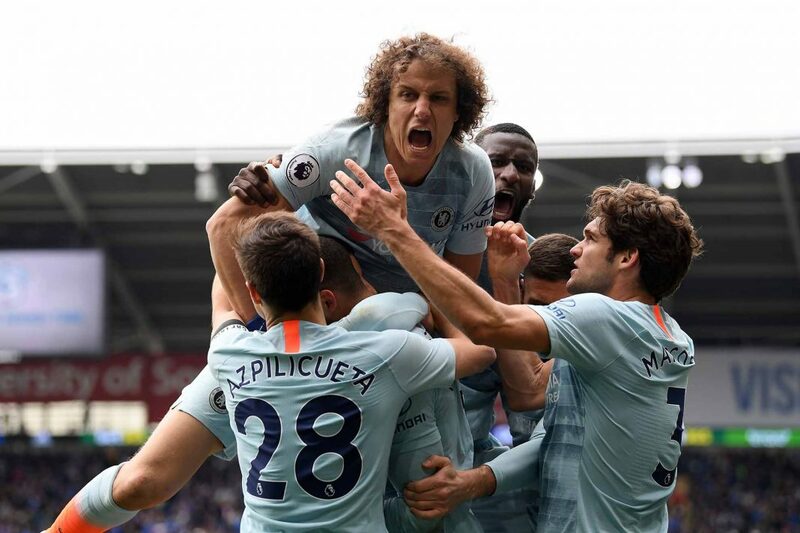 David Luiz celebrates with Cesar Azpilicueta and teammates after Ruben Loftus-Cheek of Chelsea scores his sides second goal during the Premier League match between Cardiff City and Chelsea FC at Cardiff City Stadium on March 31, 2019 in Cardiff. This disgraceful display was another in which we failed to create enough chances, in which our football was static, moribund, boring. Callum Hudson-Odoi has been called up to the senior England squad for the qualifiers against the Czech Republic and Montenegro. He is filling in for Ruben Loftus-Cheek who has withdrawn from the squad with an unspecified injury. The women will play Manchester City in the semi-final of the FA Cup. Reading will play West Ham in the other tie. Matches to be played on Sunday 14 April. The club have put out a statement about racist abuse suffered by Chelsea players in Kiev – honestly, if our side had played that badly we’d be directing the abuse at our own XI not the opposition but there is no logic in football. The club said they expected Uefa investigation and action. The Football Supporter’s Association have finally spoken up for, well, er, football fans by calling for the criminalisation of anyone running on the pitch to end. As the denizens of the west stand benches, many moons ago, know all too well the thrill of running onto the turf to celebrate with your heroes. Especially when you are young enough to run any distance without embarrassing yourself. At the moment, anyone running on the pitch is committing a criminal offence, so the law treats high spirited kids who just want to shout ‘yeah’ at Eden Hazard from a few feet closer than they otherwise might, the same way it treats the Birmingham City fan who ran on and clocked Jack Grealish. So that is teenagers potentially handed £1,000 fine, a criminal record and a banning order. Which is ridiculously disproportionate for 30-seconds dancing on a lawn. Recently a boy from Bournemouth was held in nick for 20-hours before being discharged for ‘entering the playing area’ after CCTV showed a steward pulling him over the barrier and onto the pitch. The FSA have asked stewards to exercise common sense but the stewarding community, in general and with a few notable exceptions, have higher neck measurements than IQs and they are keen to keep any vestige of authority. A very Professional approach saw us smother their attacks and control the tie until we had the chance to hit the front with Hannah Blundell’s delicious lob. Erin Cuthbert smashed home the important second and we have the edge in this tie ahead of the second leg. The real story of the night however was the sudden interest of the police in the women’s game. Plod raided the bus of the PSG fans who travelled. The police instantly labelled the fans ‘ultras’ and said they’d found ‘knives’ and ‘knuckle dusters’, as well as a quantity of hard drugs. Some of the PSG fans were refused permission to enter the ground. The real mystery is why the police want to stamp out fun at football in the women’s game. Let’s be clear the French fans had not brought knives or knuckle dusters. They would have been arrested for carrying an offensive weapon at a public gathering. And the Met announced only one arrest for the drugs. So this tidal wave of hardnose ultras appears to be not much more than any travelling group of fans. The worst crime they were associated with appears to be putting up PSG stickers and a little light graffiti. You ‘ll remember a few years ago when Sussex plod wanted to distract attention from their own chaotic, incompetent and dangerous handling of Crystal Palace fans in Brighton they turned to the ‘knives and knuckle dusters’ lie to distract the press. They dope who brought the dope probably deserves to be arrested… but the police’s overreaction tonight needs some scrutiny. In Euro 2020 qualifying Eden Hazard slotted a couple for Belgium as they beat Russia easily. Eden has now scored 29 goals in 99 internationals. Scotland did less well… in the same group, they lost on the road… 3-0 to Kazakhstan. Wow, international football hasn’t been this much fun for ages. Callum Hudson-Odoi became the youngest full England cap in Chelsea’s history beating Glen Johnson’s record. Callum’s confident performance was almost capped with a goal when his classy shot was parried by the goalkeeper, only for Tomas Kalas to bundle in the rebound for England’s fifth. The night had a distinct Chelsea feel as England looked a little wooden until Ross Barkley replaced the ineffective Eric Dier on 17-minutes. The Chelsea midfielder instantly offered more forward momentum and started the movement for two of the goals. Olivier Giroud was on target for France as they eased past Moldova 1-4 in Chisinau. Eden scored on the occasion of his 100th cap for Belgium as they beat Cyprus 2-0 and Antonio Rüdiger was at the heart of the German defence as they snatched a late win against their old enemy, the Netherlands, 2-3. Proper football resumes next weekend. Callum Hudson-Odoi must be pinching himself as he became the youngest Chelsea player to start a competitive international. He played well too as England fought back from a goal down to dominate again. Ross Barkley stamped his own authority on the match with two goals and commanding performance in midfield. Harry Kane got his usual goal and Raheem Sterling rounded off the scoring with a cupped ear gesture to the home fans who had been monkey chanting throughout. A bad night was heading for extra-time when Maren Mjelde popped up, flashed her shot across the ’keeper and suddenly we were in the semi-final for the second year running. Emma Hayes can be very proud of her team as they defended resolutely and wouldn’t have needed the late away goal if we hadn’t been a little unlucky when Ann-Katrin Berger dropped the ball into her own net. We shouldn’t dwell because the big German played well and we qualified. We play holders Lyon at the end of April. Gonzalo Higuaín has retired from international football after 75 caps and 31 goals for Argentina. The move should leave him rested and ready after international breaks, if we are allowed to keep him. Six school boys in the side for great experience but no breakthrough in the early Norfolk sunshine. A word for poor Huddersfield as they join a small, unenviable group of clubs to be relegated before the clocks go forward. Maurizio Sarri doesn’t really know what he is doing. This disgraceful display was another in which we failed to create enough chances, in which our football was static, moribund, boring. The manager must take responsibility for the lack of direction and progress. He left Hudson-Odoi on the bench all afternoon because Cardiff away is so much more difficult than international football and he didn’t want his side to have any direct running or attacking threat. He did bring on Ruben Loftus-Cheek who scored but the power of the youngster makes you wonder why he didn’t start. Cardiff were rightly furious about our equaliser as the linesman missed Azpilicueta clearly offside and were convinced, rightly, that they should have had a couple of penalties. It was a poor afternoon for all involved. But three-points and a step closer to the top four. The women signed off at home with a disappointing draw. The big family crowd witnessed Beth England open the scoring only for Gilly Flaherty to cancel it out.